Summary: This article is a model of how one teacher used inquiry to revise his classroom practice. 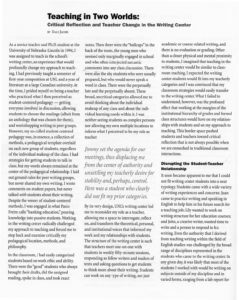 The author explains how his experience working in a college writing center led him to revise his approach to classroom teaching, leading him to a pedagogy that was more student-centered and focused on individuals. He describes a process of “productive disruption” in his thinking about his practices, followed by critical reflection that led to change. This article would be useful in a professional development context focused on teacher inquiry or reflective practice, especially early in the discussions, as an example of this approach in context. It could also be recommended to writing center tutors who move into the classroom, to demonstrate how their skills as tutors can effectively translate into the classroom. I had strategies for getting students to talk in class, but my words always remained at the center of the pedagogical relationship. I laid out ground rules for peer writing groups, but never shared my own writing. I wrote comments on student papers, but never talked with students about their writing. Despite the veneer of student-centered methods, I was engaged in what Paolo Freire calls ‘banking education,’ pouring knowledge into passive students. Working in the writing center radically challenged my approach to teaching and forced me to step back and examine critically my pedagogical location, methods, and philosophy.